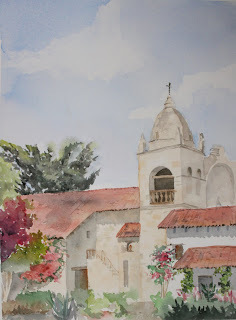 Last Saturday, on the second day of the Paint Out, most of us went over to the Carmel mission. I sat in the (breezy) courtyard and painted a side view of the mission church. My painting is uncharacteristically pastel! Thanks, Wendy! I miss seeing you-will try to come to the painting group next week. Plenty of Plein Air at Asilomar!